I’ve been conducting a little hair color experiment lately. I guess most of you know that I tend to keep my hair a color not found in nature. Well, not in hair, anyway. Birds, maybe, but not hair. 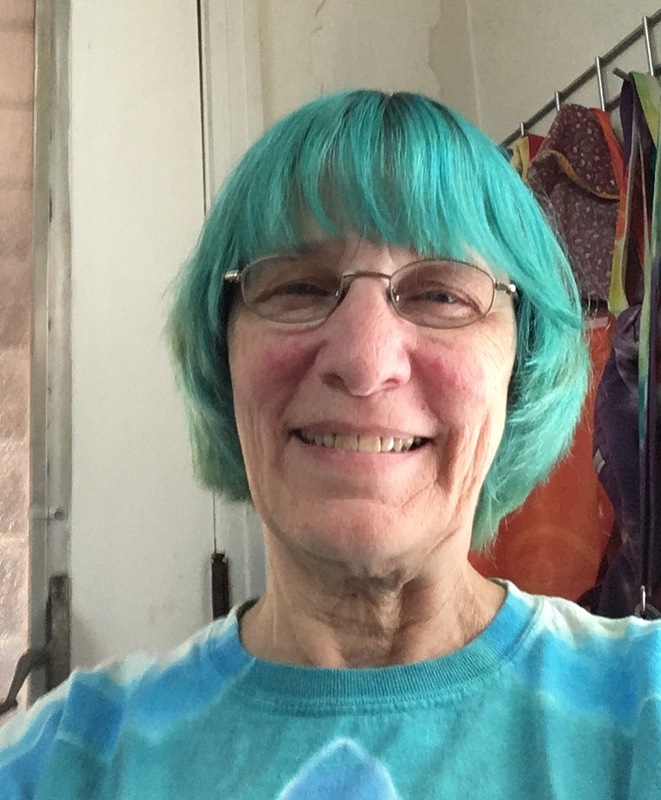 My natural color is kind of mousy and I may have put up with it when I was an all-natural hippie wanna-be in high school, but I’m a grown-up now and I can have blue hair if I want to. Or pink or bright red or purple or any combination of those colors. 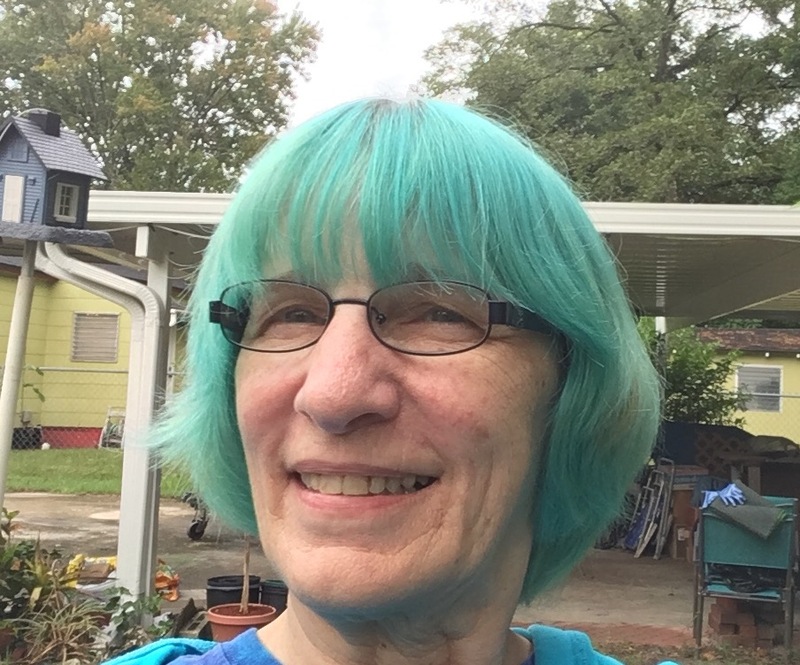 It was bright pink back in May, but it had faded badly between May and early August, so I was starting to look more like a bleached blonde than a quirky artist. Bleached blonde may work for some people, but it’s not a good look for me, so I needed to choose a new color. 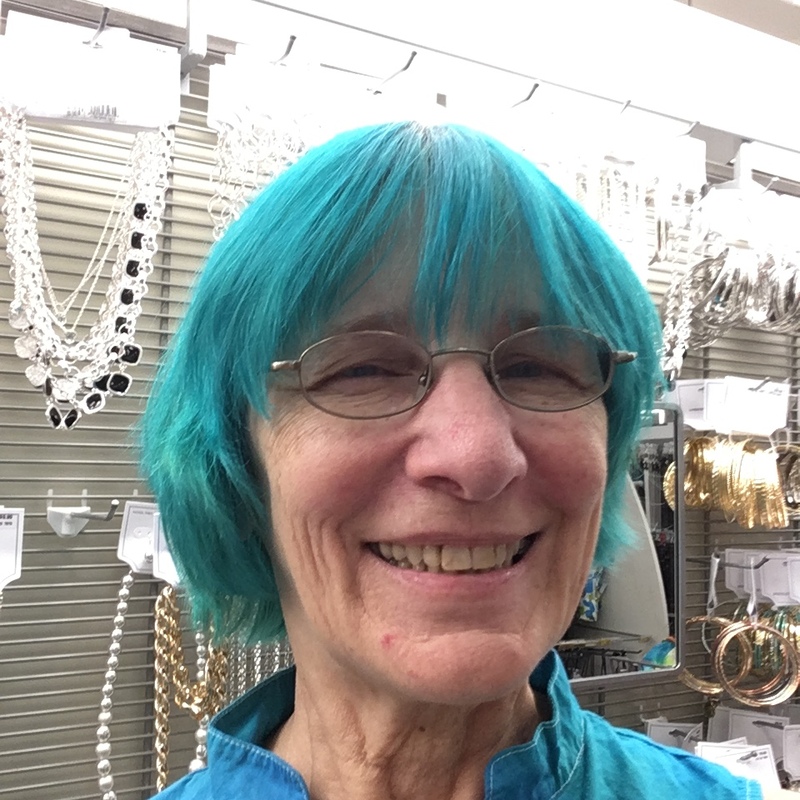 I decided to go for turquoise. 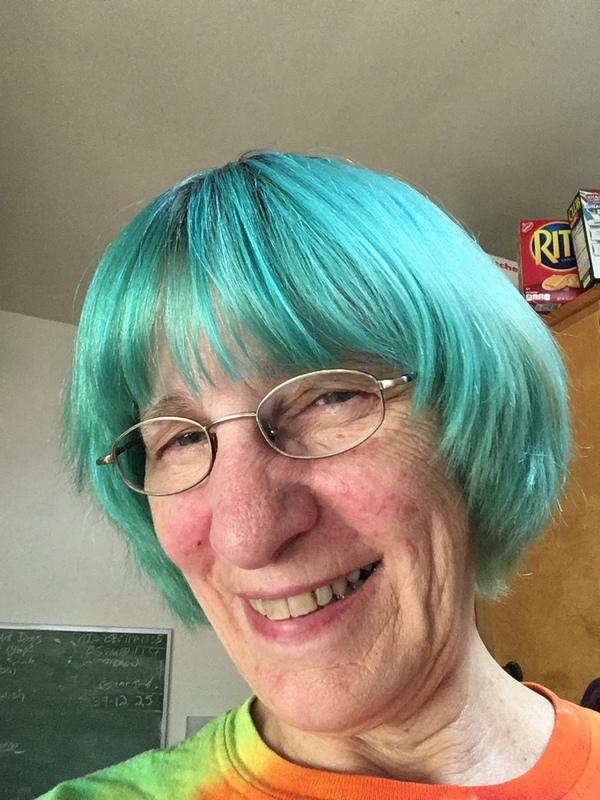 My daughter has used a lot of different brands of quirky hair color and she recommends Punky Colours, so that’s what we were looking for when we went to a local beauty supply store. A nice employee said they did have some and pointed to it on the shelf. They did, indeed, have some Punky Colours, but there was not a single shade of blue on that shelf. I wanted blue and I didn’t know of any other store in town that carried Punky Colours, so I started looking at the other brands. My daughter ruled some out immediately, but there was one there that neither of us had tried before. The brand was “Adore” and it had some pretty shades of blue. 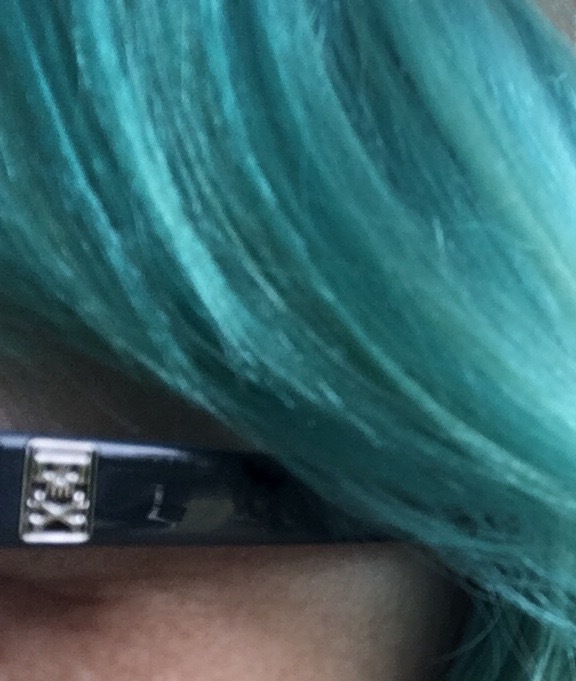 The one I chose was actually called “Emerald” but the hair swatch beside it was definitely not green. It appeared to be the color I was looking for, so I decided to give it a try. My daughter, God bless her, is always willing to apply hair color for me. This is a good thing. The last time I tried to do it by myself, I got dye all over my bathroom. I was using bright red that time, so it looked as if someone had been murdered in there. My daughter doesn’t need a mirror, so she can apply the dye outdoors. As careful as she is, there are always drips that must be cleaned up along the way. My daughter became concerned because the drips were way too easy to clean off my ears and scalp. She figured that meant the dye was not going to last very long on my hair. It was too late to make a different decision at that point, so she carried on, but we decided that if it washed out too quickly, we would just try another brand the next time. Live and learn, right? I highly recommend Adore brand hair color to anyone who wants their crazy color to last more than a day or two. Did you notice the new glasses? I picked those up today. I’m still adjusting to them but I can definitely read the dates on coupons now. And here’s a close-up, for those who read my post last week and wanted to see the skull and crossbones. Am I a cool grandmommy or what? 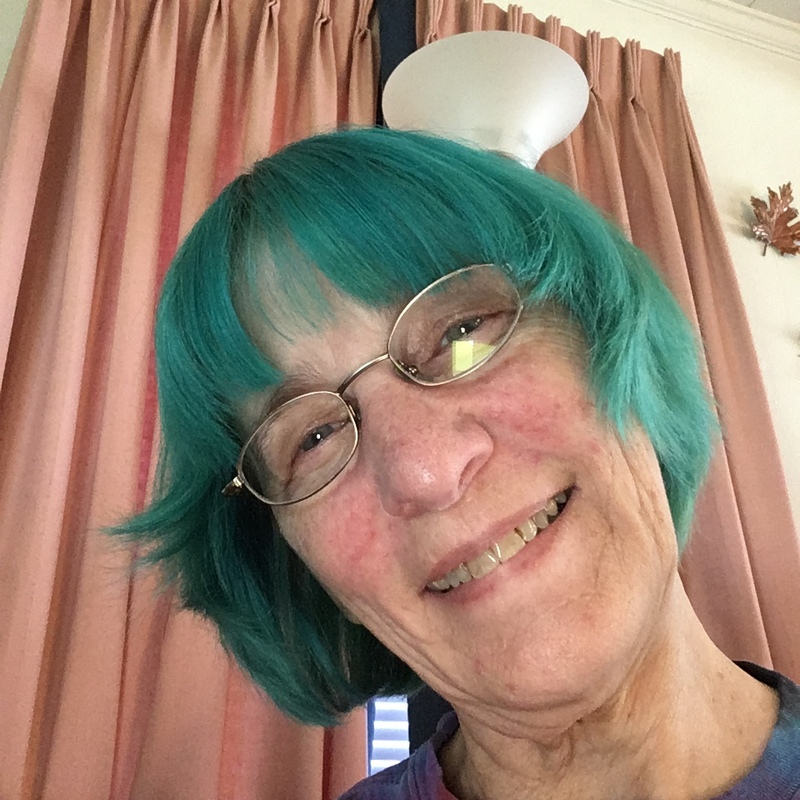 This entry was posted in Uncategorized and tagged Adore hair color, glasses, hair color, new glasses, Punky Colours on August 31, 2016 by releaf1954. Wednesday has rolled around again and there are a few people who will actually notice if I don’t put up a blog post. They might even worry about me a little, so I intend to save them that worry, even though I don’t have any brilliant ideas for a blog post. What have I been doing this past week? Well, I took my daughter to get new glasses and while I was at the Target Optical Shop, I decided to make an appointment for myself as well. They wanted to know how long it had been since I’d had my eyes examined and I couldn’t remember. I vaguely recalled that I was still working my last cubicle job at the time and I quit that job ten years ago. All I knew for sure was that it was getting harder and harder for me to see the expiration dates on my coupons. My appointment was yesterday and my daughter rode out to Target with me because she wanted to get her new nose pads checked. She also wanted to hit all the Pokestops between our neighborhood and the Target Optical Shop. I was glad to have her along because I couldn’t drive and hit Pokestops at the same time. I was nervous about my eye exam because it had been so long and I had fuzzy memories of some parts of an eye exam being uncomfortable. My own nerves were far more uncomfortable than the eye exam. I was dreading the glaucoma test. It was nothing. The doctor wanted to dilate my pupils and warned me that the drops would sting. I got all worried and then they didn’t sting at all. Whew! The exam took some time, but it was not difficult or scary, and soon I will have new glasses that will help me read those expiration dates on my coupons. I had spent a long time looking at frames while my daughter was having her exam last week and I was a bit worried about that because the only frames I liked were children’s frames and I wasn’t sure they would work with my prescription. I looked again at women’s frames and tried to like some of them, but even the lady who was helping me agreed that they were not flattering. I tried and tried, but I kept going back to the children’s frames and finally, the nice lady took measurements and said those frames would work. My daughter said my grandsons would think they were cool because they had little skull and crossbones designs on the sides. I hadn’t noticed that but I’m okay with it. I’m just happy I’m going to be able to read fine print again. 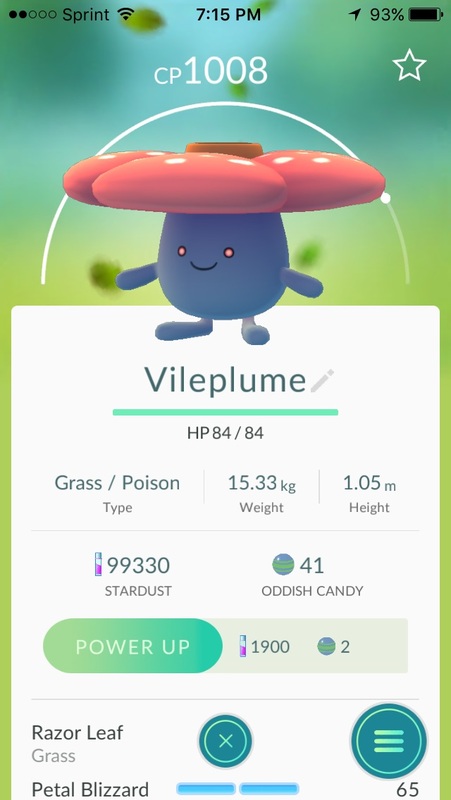 It’s my first Pokemon with more than 1,000 CP. This entry was posted in Uncategorized and tagged eye exam, glasses, Pokemon Go on August 24, 2016 by releaf1954. Have I done anything worth blogging about lately? I haven’t painted. I haven’t filed my taxes. I haven’t finished any tie-dye. I started some tie-dye. I watched the weather forecast for weeks, waiting for a good day to put some Rayons into pre-soak. Our favorite customer ordered several dresses and we wanted to get started on them, but Florida is wet in the summer. It rains almost every day and it’s hard to tell, just based on a forecast, which days might be the rare ones without rain. Day after day, I would see a forecast that called for a twenty percent chance of rain and I would decide not to put anything on the line. The rain did not materialize, or it came late in the afternoon. Finally, I decided to risk it, because Rayon is thin and doesn’t take all day to get dry. On a hot day, it can take as little as two hours. I made my lists, I gathered my Rayons into bags according to color palettes, and I brought in my five-gallon bucket so I could mix up a soda ash solution. I carried the heavy bucket out to the clothesline and I put the first batch of Rayons into the solution. Once that batch was up on the line, I did the same with the other three bags, one at a time, until all four clotheslines were full of blanks. It was about 9:30 in the morning when I put up the last of them and I thought that would give them plenty of time to dry out before the afternoon thunderstorms could roll in. I went into the house and sat down to get caught up on Words With Friends and Facebook. 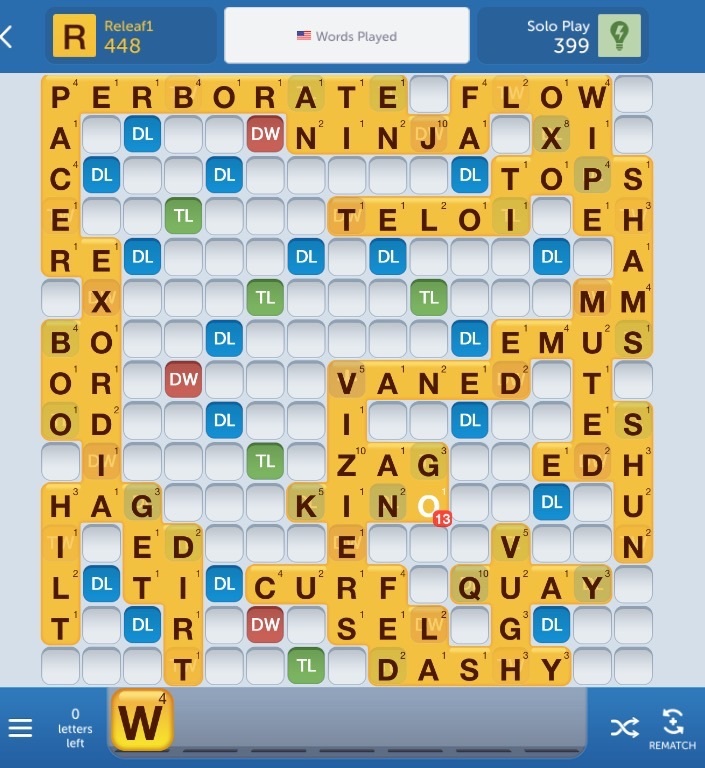 From Facebook, I always go right back to Words With Friends because solo play gives me a turn every two minutes. As I mentioned last week, it patronizes me like crazy but I love words, so I keep playing. I have still won every single game. The solo play knows all kinds of words it can’t even find a definition for, but it still loses each and every game. It gives itself all the ten-point letters and gives me mostly vowels and it still loses. It is incredibly good at losing. I was busy putting vowels together in interesting ways when I got a text from my daughter, asking me to take her to the grocery store to get some milk. It was still well before noon, so I had no qualms about leaving the blanks on the line while I took my daughter to Publix. She did her usual shotgun chore of hitting Pokestops along the way and then we caught a couple of Pidgeys in the parking lot before we went inside to get milk. We were on our way back to my daughter’s house when I started to notice the black clouds gathering. She dropped the milk off at her house and then came back to my house because she needed to do some laundry. It was still morning, but those clouds just kept piling up. Then the sprinkling started. When we got to my house, we went out to the clotheslines and pulled the lighter-weight things that were already done. My daughter brought up a weather map on her phone and we saw a big blob of orange and yellow heading, apparently, straight for my back yard. The blanks were not dry enough, but if we let them get seriously rained on, the soda ash would rinse out. We needed the soda ash to stay in – that was the whole point – so we quickly pulled everything off the line and brought it in the house. We plunked the bags down and started heating water for coffee, relieved that our blanks were not going through a Mother Nature rinse cycle. Of course, the storm clouds just broke up and blew away while we were drinking our coffee but it was too late for us to put everything back up. We no longer trusted the sky. This entry was posted in Uncategorized and tagged Pokemon Go, tie-dye, weather, Words With Friends on August 17, 2016 by releaf1954. I’m still playing Pokemon Go, but the truth is, I spend a lot more time playing Words With Friends. I am in the middle of thirty-nine games with three different people and I still have to do solo play just to keep going. I’m pretty sure my human opponents are tired of the speed with which I respond. I’m always hoping they will come right back, but they rarely do. Solo play responds in two minutes and that still seems a bit slow. It’s artificial intelligence; it has its answer within seconds. It’s just patronizing me. I know it’s patronizing me because it plays all kinds of exotic words I’ve never heard of, but it never, ever wins. Perborate? Exordia? Teloi? All three of those words are underlined in red on my netbook as I’m writing this, but Words With Friends knows them. It can’t manage to win with them, but it knows them. It’s trying to build my vocabulary without injuring my ego. I prefer real people, pulling things out of their own brains without using a nearly infinite internet dictionary. Oh, I know there are cheat programs for games like this, but I don’t use them and I prefer to believe my opponents don’t use them, either. It’s not about winning, It’s about playing with seven letters and searching my vocabulary for ways to put them together. Since I sat down to write this blog post, two of my human opponents have actually taken their turns. Woo hoo! Now I get to have some real fun. This entry was posted in Uncategorized and tagged cheating, vocabulary, words, Words With Friends on August 10, 2016 by releaf1954. 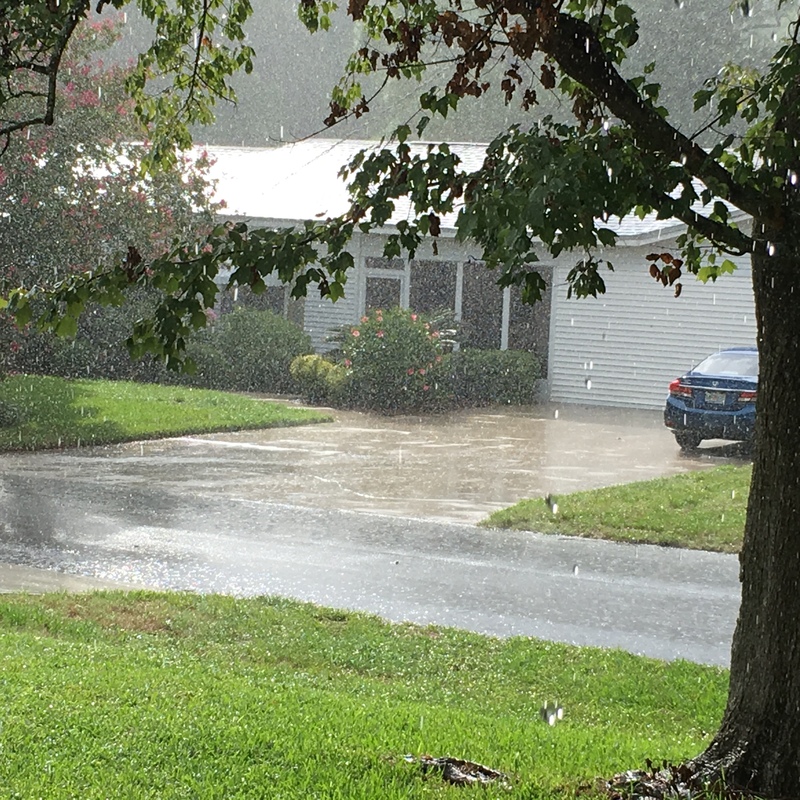 I am looking out my window and watching rain come down in the midst of a bright, sunlit afternoon. The sun is bouncing off the metal roof across the street and it’s so bright it’s making me squint, but between that roof and me, steady rain is falling. That’s the weather report from blog day in Florida. Now for the Pokemon Go report. Yes, I am playing. If you read last week’s post, that will come as no surprise. My daughter is the one who put it on my phone, but I didn’t protest too loudly. She downloaded it for me Friday afternoon, but she didn’t have time to stay and help me learn how to play it, beyond the most basic instructions for flipping Pokestops and capturing Pokemon with Pokeballs. The next morning, I got up early to go to the local flea market. I was sitting in my car, waiting for the flea market to open, when a Pikachu spawned nearby. I didn’t have a Pikachu and I wanted one. I felt a bit silly, but I got out of my car to try and track down that Pikachu. As far as I could tell, it was right in the middle of the first flea market building, but I couldn’t get my game to let me capture it. I couldn’t get my game to do anything and I couldn’t message my daughter about it because it was before eight o’clock in the morning. She would not take kindly to being messaged about a Pikachu that early in the day. I had to let that Pikachu get away. I did ask her about it later in the morning and she taught me how to force quit the game and re-load it. That’s what must be done when it freezes up and won’t do anything. Good to know. She also told me we should check out a Pikachu nest in a local park. I thought that sounded like fun, so I picked her up and we headed down there. Shotgun is a crucial position when both driver and passenger are playing Pokemon Go. Of course, you can’t drive and play at the same time, so the person in the passenger seat has to balance two devices and make sure no Pokestops are missed along the way. These must be tapped and spun so that Pokeballs and other items can be collected. Timing is critical if you are trying to do this from a moving vehicle and my daughter has developed excellent timing. The Pikachu hunt turned out to be a bust. There had been an update and the Pikachu nest was gone. We had fun catching other things and chatting with other players, which is the coolest thing about this game. It gets introverted nerds (yes, I am one of those) out of their houses and into situations where it feels normal to socialize with dozens – or even hundreds – of other players. It also gets us to exercise, as we see things on our radar and walk all over a park or parking lot trying to find them. It reminds me of being at the beach, picking up shells. We just keep walking and walking, without realizing how far we’re going, because we’re finding cool things and we want to find more. 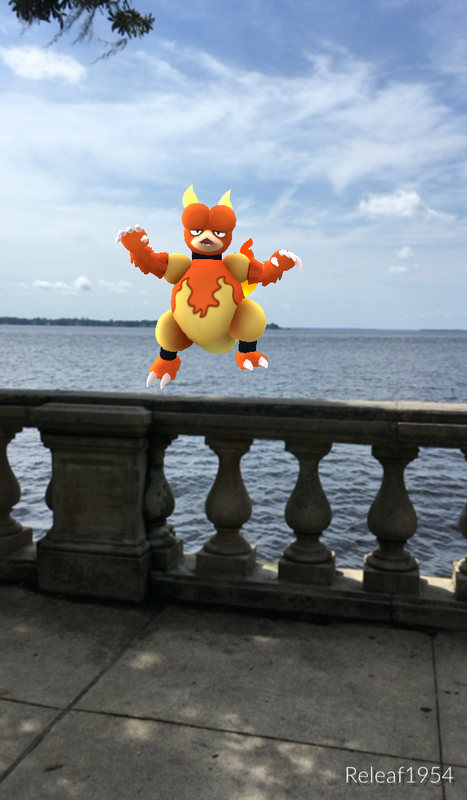 The biggest thing we found today was a Magmar. The goofiest may have been the Psyduck. My daughter had dropped a lure on a Pokestop, which draws more Pokemon to that stop, so we got a lot of those. One of them appeared to spawn in my hand. Yes, I weakened, and now I’m playing Pokemon Go like most of the rest of the world. It may be a little silly, but it sure beats watching politics on TV all day. 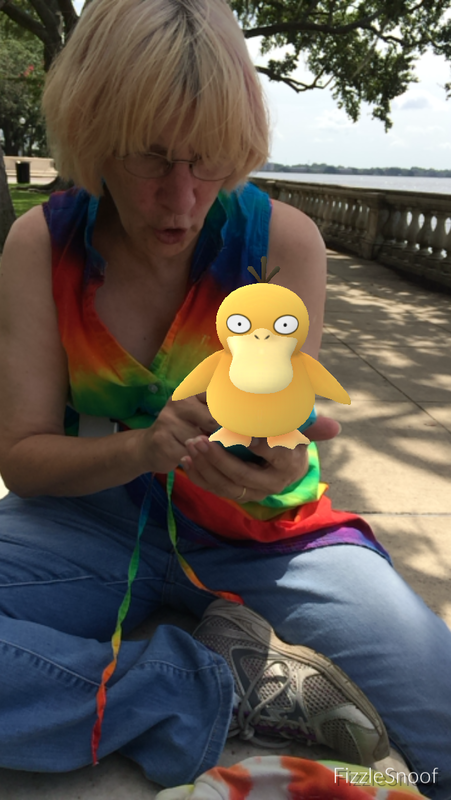 This entry was posted in Uncategorized and tagged Magmar, Pikachu, Pokemon Go, Psyduck, sun shower on August 3, 2016 by releaf1954.